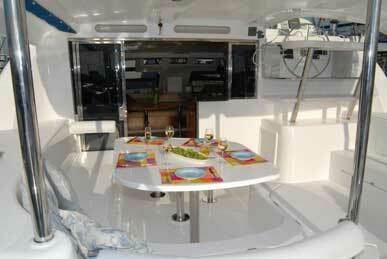 The Leopard 46 Catamaran is offered for both bareboat and skippered charter in the Caribbean. 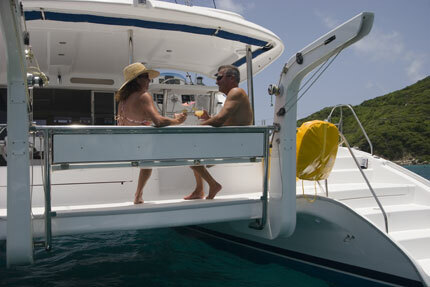 You can sail both the Leeward and Windward Islands in this beauty. Built by Robertson and Caine, and designed by renowned architects Morrelli and Melvin the Leopard 46 is a blue water cruising catamaran that combines spacious living accommodations, great performance with solid construction and excellent ventilation. Unique to the Leopard 46, the raised helm station is situated in the extended hardtop roof, protected by a hardtop bimini, with all controls led aft, offering excellent visibility and ease of maneuvering, even with a limited crew. In addition, this innovative design maintains open access to the cockpit so the helmsman is not cut off from the rest of the party. Louver steps from the foredeck to the coach roof provide shade in the saloon and surefooted access to the roof and hard-top. 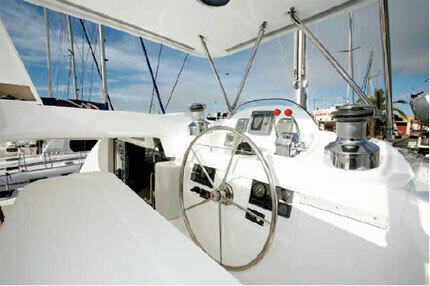 The deck layout is clear and uncluttered, with walk-through access to the aft swim platform, wide side decks and the mainsail and jib controls all led aft to the helm station, for ease of handling. 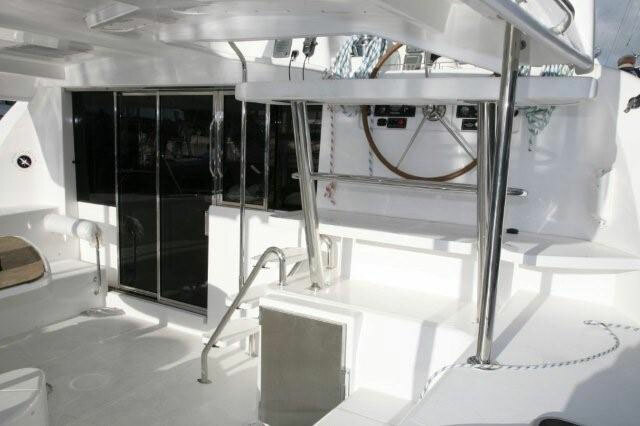 The large cockpit with outside dining area is protected by a functional hard-top bimini fitted as standard, providing a stable platform for access to the mast and boom. A stack pack system, double purchase halyards, mast track and slide system make handling the fully battened mainsail surprisingly easy. The Leopard 46 has a spacious saloon area with a wide U-shaped settee with seating for eight that converts to a double berth. 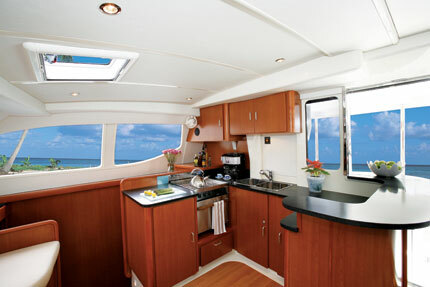 The aft-facing galley with plenty of room to circulate has all the amenities and ample counter space. A softly curved Corian cocktail bar overlooks the adjoining cockpit area, enabling drinks and hors d’oeuvres to be served directly in the cockpit. Two overhead hatches and three opening ports forward provide excellent ventilation. This sailing catamaran has four luxurious double staterooms with dressing areas and en suite heads and separate shower stalls. There is a single crew cabin in one hull and crew head in the other. 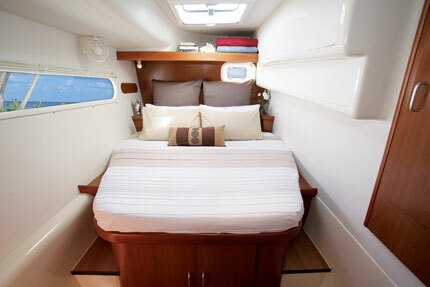 There is ample storage space throughout and numerous opening ports and hatches provide superior ventilation. 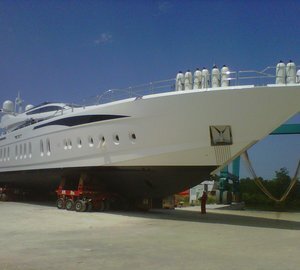 The yacht is equipped with a powerful generator and air conditioning. 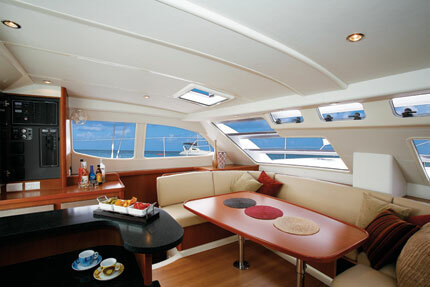 This yacht is the perfect choice when needing to accommodate a large charter group or family vacation! 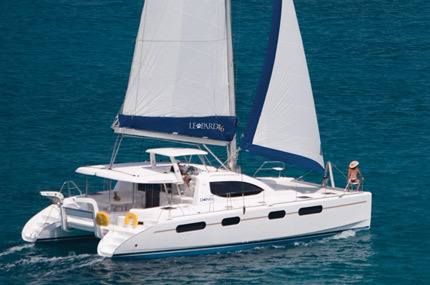 This Leopard 46 sailing catamaran has four luxurious double staterooms with dressing areas and en suite electric heads and separate shower stalls. 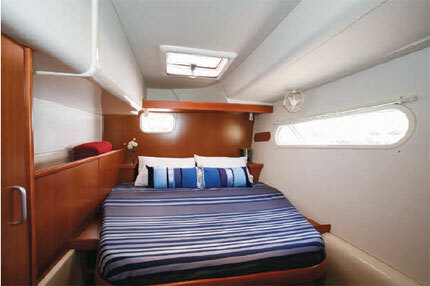 There are single berths forward in each hull. The salon converts to a double berth. 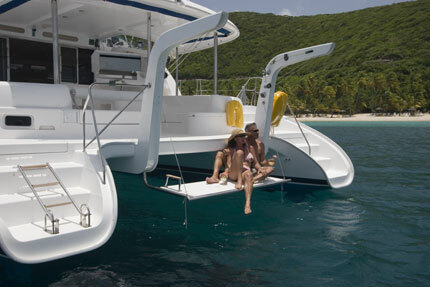 This catamaran can easily accommodate up to 11 passengers.